'...Most engineering companies employ geomorphologists on their full-time staff and all require a text that guides them to the core of the subject. This book fulfils that need...' Extract from the Foreword by Professor Denys Brunsden, University of London, King's College. Geomorphological landforms and processes exert a strong influence on surface engineering works, yet comparatively little systematic information on geomorphology is available to engineers. 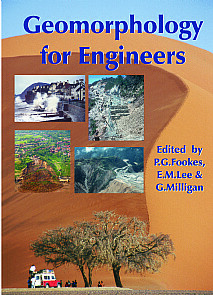 This book presents a worldwide view of geomorphology for engineers and other professionals on the near-surface engineering problems associated with the various landscapes. This new and completely revised edition has additional chapters with an improved format and is broadly divided into three parts. The first part is concerned with the major factors which control the materials, form and processes on the Earth's surfaces. The second part deals with the geomorphological processes which help shape land surfaces and influence their engineering characteristics and the final part covers environments and landscapes, including some specialist chapters. Each chapter is written by leading authorities on the subject and is both self-contained and referenced with other chapters as appropriate to make a balanced whole. Practitioners and academics in civil, geotechnical, foundation engineering, soil and rock mechanics, and engineering geology. Practitioners, postgraduate and advanced undergraduates in geomorphology, civil engineering, including road and rail construction, river, canal and coastal engineering; geohydrology. Practising physical geographers and geologists and postgraduates in these disciplines.